Back before Christmas I purchased a PA-10 lower half and then a PA-10 upper half. The upper half came straight to me and the lower half transferred to me through my FFL. I slapped them together and immediately noticed that there was the largest gap that I'd ever seen between the upper and lower receivers (at the vertical part is was about 2mm). In addition, the fit between the upper and lower was incredibly loose. In almost 30 years of handling/shooting AR type rifles, I've never seen one that approached being so loose. The hole in the rear lug of the upper was obviously egged. I installed a Aero Precision AR10 upper on the lower and it fit perfectly tight. So, I called PSA and they told me to send in the entire rifle. I provided a letter detailing the problem along with the rifle that I sent back. A couple of weeks later I received the rifle back exactly as it was with no explanation. I called to find out why they didn't fix the looseness and gap issues. I was told that it fired, so they consider it to be "within PSA tolerances". Of course I responded that I didn't realize PSA's tolerances were looser than industry tolerances. The lady I spoke with was nice. I explained to her that this was not acceptable and asked her to speak with her manager about the situation. She did and he said that I could return the upper half, but not the lower half since it had been transferred to me. Of course an upper half without a lower half doesn't work very well, so I again told her that that was not an acceptable solution. She asked him again and was told that's all they could do because the rifle does fire and the lower was transferred to me. I then upped the ante and told her that I had spent well over $10,000 with them over the past few years. I asked her to tell her manager if they don't take the lower half back too, that I will no longer purchase from them. She emailed me back and said that they would not take back the lower half. I now know where I stand with PSA. So, I returned the upper half, will never purchase from them again and now have a PA-10 lower half. I could simply install an Aero Precision upper, but the cosmetics of it don't match with the lower at all. So all this to ask, is there an upper receiver from another manufacturer that matches cosmetically with the PA-10 lower half? My guess is that someone is making these for PSA and perhaps they sell their own uppers. I have interchanged uppers between a DPMS LR-308, SI Defense, and PA-10 with no issues. I have also exchanged the uppers on my 2 PA-10's with no issue. They fit fine, with the upper/lower fit being looser in some combinations than others. All worked fine with no function issues. As for being unhappy with the upper/lower fit, I am not sure you would, or will ever, get anywhere with it. Have you test-fired your PA-10? Ultimately as much as it pains you, the fit is unimportant if the weapons functions well. Another manufacturer known for this (with a much better reputation!) is Colt, they don't give a rats a$$ if you *think* it isn't tight enough if it runs. Do remember you are buying literally one of the cheapest semi-auto 308 weapons available, much less the 308 AR platform. I think the ONLY question you should be concerned about is "does it run?". Anyways given the selection of uppers I have swapped around on my large frame AR's, none of them look like they match in the slightest. If you want to match, you will need to get a PA-10 Gen 2 upper of some type. Even the PA-10 Gen 1 uppers have a different shape. If you are so concerned with cosmetics, I would just sell your lower, and get a matched upper/lower set from an alternate manufacturer. It will be a lot more expensive, and probably cost you the same as your whole PA-10. I guess you'd have to have seen the 2mm gap and felt the movement between the upper and lower to understand. No AR that I've ever seen or held has been even close to how bad this one was. I have an assortment of Colts and don't have one that I'd consider even slightly loose. In fact, I can't think of a single AR that I have that seems loose. I imagine some technically have looser upper to lower fit than others, but I've never noticed an issue. This PSA upper was simply defective and PSA wouldn't own it. There's nothing wrong with the lower that I'm stuck with. Well who knows if it is actually the upper or lower that is defective, it could be either unless you have multiple uppers/lowers to swap between and/or sophisticated measuring equipment to actually check the dimensions of each. I am located in central OH if you are nearby and would want to check the fit on your lower compared to my 2 uppers. Otherwise you are just rolling the dice, hence my suggestion to just sell the lower and get a matched upper/lower set from somewhere else. Or God forbid a complete rifle with a warranty. I honestly think the quality of the PA-10 upper/lowers is good (at least mine are!) and being forged they are the closest thing to a standard forged AR lower. Out of curiosity did you somehow end up with a Gen 1 and Gen 2 mix? This would also help explain the fit issues but supposedly even these mixmasters work OK. Sorry about the fit of your receivers. Are you close to a PSA store? 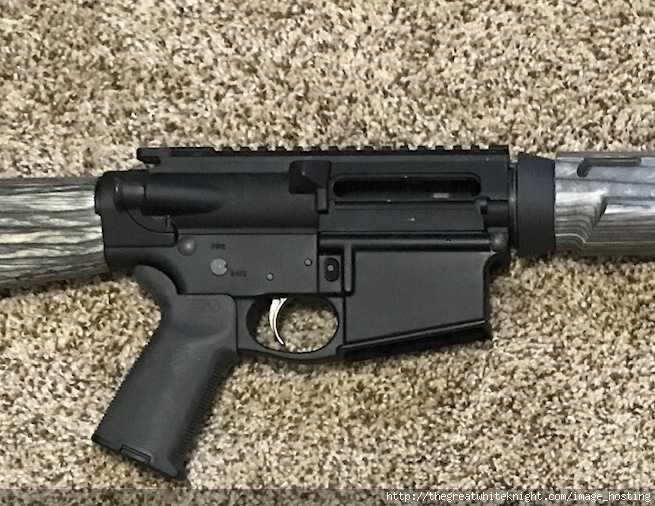 You can always carry the lower in and fit some uppers into it to find a good match. Anyway, hope you find a solution. My PA-10 as a .308 shot great and I have almost no movement at all between the receivers and no noticeable gap. An accuwedge keeps it solid. Rebarreled to 6.5 Creedmore so I’m anxious to see how it shoots. I'm not close to a PSA store, but they do collect Georgia sales tax for some reason. All of the locations shown on their website are in South Carolina. Your idea is a good one. The next time I'm over there I'll go by one of the stores and see what I can find.